Surrounding yourself with information about the raw food lifestyle is important when you're beginning your raw food journey. That's one of the tips I shared with many of you who are subscribed to our mailings--and it's a very important tip. Even after being raw for over three years, I still surround myself with information about the raw food lifestyle. It not only keeps me inspired, it allows me to feel an even deeper connection with the community of which I am a part. One of my friends, Beth Berry (better known as Bunny Berry), has become a constant source of inspiration for many individuals learning about the raw food lifestyle. She puts out video blogs through YouTube and has developed a wonderful group of followers in her RawFu community. As most raw foodists can tell you, your mind becomes clearer on the raw food diet and creativity soars as a result. Beth was already quite creative before raw, but on a high raw diet she has become even more so. I want to share something that she has recently created for the raw food community! RawFu Magazine is a brand new magazine Beth has created. The first issue features the lovely Philip McCluskey who was interviewed about the foods he creates and eats. Knowing Beth, this is going to be a gorgeous magazine filled with fun, helpful information with a dose of humor thrown in among the pages. I am expecting a lot out of this magazine and I know I won't be disappointed. The marketing genius that Beth is, she has managed to work in a wonderful bonus for subscribing to this new magazine--a chance to win something! The makers of Blendtec (a high speed blender with similar power to the Vitamix) are giving away a blender each month in May, June, and July to one lucky RawFu Magazine subscriber. Sweet! If you've been looking for a source of continued raw food inspiration that isn't online, a magazine may be what works for you. There are other wonderful raw food magazines available, too (check the Books and Mags Category of the All Raw Directory). I'm featuring RawFu Magazine today because it's a new one that's just coming out for the first time, in addition to knowing it's going to be fabulous because I know Beth puts her all into the projects she creates. Check it out! WOOT WOOT!! 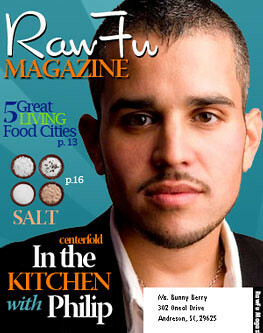 So excited for RawFu Magazine! I know it's going to RAWK the raw world! I believe that more and more the main stream is becoming more interested in eating organic, fresh, ripe and REAL FOOD. I think there is room for a number of raw publications and I'm ready for my old subscription of Bon Appetite to run out. All I need are my raw magazines!! I am having a hard time keeping my pants on waiting for the FU rag to come out!!!! I agree with Penni, all i need is raw mags, bring em on! And of course Philip is great! I'm really looking forward to the magazine. Is the Beth Berry spoken of here Beth Dawn Berry from the Feingold ancestry? I'm sorry, but I don't know.